This week our design team were busy investigating all kinds of children’s toys donated by members of our local community as part of a design project. For years we’ve been aware that readily available scooters and bikes aren’t suitable for some children with motor disorders. In 2014 our team worked with Summer to design a trike that meant she would be able to maintain her independence and didn’t need to use her wheelchair so frequently. Her wheelchair didn’t allow her to move actively and she wasn’t able to push it herself, but the trike helped Summer keep her muscles as strong as possible, and allowed her to choose where she went! After making two more trikes for children in 2017, we realised there were many more children like Summer who could benefit from having access to a big push-along trike. When some children are riding bikes and scooters, others with motor and coordination disorders can be excluded from these active (and above all great fun!) social play experiences. Now, our team is working to design a trike to suit older children who have outgrown the ride on toys made for toddlers. We’re designing this trike to help all 8 children on our waiting list and many more in the future. Even though the original design worked very well for Summer, it is very difficult to manufacture and so hard to make easily available for other young people who could benefit from one. 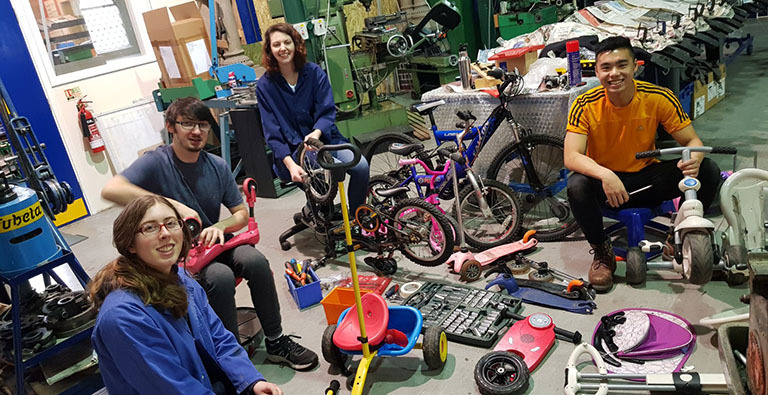 Following an appeal to the residents of Abbots Langley to donate their used children’s toys, we were inundated with support and collected a wide range of toys to help us on the way to designing a new and easily manufacturable trike. Examining existing products is a great way for our team to generate ideas and start prototyping new designs. Thank you to everyone who supported this project with a donation, we look forward to sharing our designs and starting to test them very soon! If you know someone who could benefit from a trike like Summer’s or would like to be involved in this project, do please get in touch.